Basquiat: Boom for Real is the first large-scale exhibition in the UK of the work of American artist Jean-Michel Basquiat (1960­-1988). Basquiat came to the attention of the Art world in the late 1970s in the post-punk underground art scene in downtown New York. By 1982, he had gained international recognition and was the youngest ever artist to participate in Documenta 7 in Kassel. His vibrant, raw imagery, abounding with fragments of bold capitalised text, offers insights into both his encyclopaedic interests and his experience as a young black artist with no formal training. Since his tragic death in 1988, Basquiat has had remarkably little exposure in the UK; not a single work of his is held in a public collection. Drawing from international museums and private collections, Basquiat: Boom for Real brings together an outstanding selection of more than 100 works, many never seen before in the UK, and opens at Barbican Art Gallery on 21 September 2017. 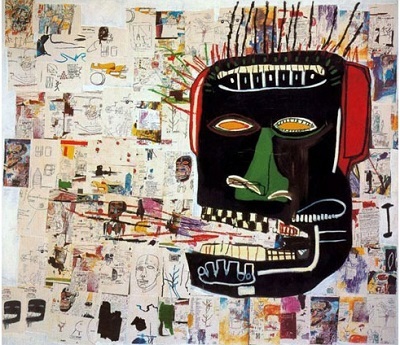 Highlights of the Barbican’s exhibition include a partial reconstruction of Basquiat’s first body of exhibited work, made for Diego Cortez’s watershed group show New York / New Wave at P.S.1 in February 1981. Fifteen works are brought together for the first time in over 35 years, allowing visitors to understand how Basquiat so quickly won the admiration of fellow artists and critics. The exhibition continues with an exploration of his energetic, often collaborative work as the prodigy of the downtown scene; from the birth of SAMO© to his relationship with Warhol. In the downstairs spaces, new scholarship sheds light on some of his most acclaimed paintings and drawings. A famously self-taught artist, Basquiat sampled from an extraordinary breadth of source material – from anatomical drawings to bebop jazz to silent film . By londonvisitors2014 in Exhibitions on July 11, 2017 .